Commuters walk past matatus on the road within the city centre on December 4, 2018. An early morning meeting between President Kenyatta with Governor Mike Sonko and members of the Nairobi Regeneration Committee was behind Tuesday's lifting of the directive banning public service vehicles from accessing the city centre. The President is said to have discussed the transport crisis in the city that was occasioned by the ban that took effect on Monday. The State House meeting came immediately after Mr Sonko had beaten a hasty retreat at dawn on Tuesday and announced that he had lifted the ban to save Nairobians from the pain of trekking to the city centre. Sources close to the governor told the Nation that the State House meeting was preceded by a telephone conversation with "higher authorities" upon which he made the announcement lifting the ban. "There was intervention from State House. He (Sonko) had to make the announcement first before proceeding to State House with the Regeneration Committee for further consultations," said a source close to Mr Sonko who sought anonymity because he is not his official spokesman. The regeneration committee is co-chaired by Mr Sonko and Tourism Cabinet Secretary Najib Balala. Nairobi Senator Johnson Sakaja separately told the Nation that he was aware of the State House meeting although he did not attend as he is not a member of the committee. "As I sought help over the crisis, I was made aware that a meeting between the President and the regeneration team was scheduled even though I don't know what was discussed as I was not in attendance," he said. But Mr Sonko's spokesman, Mr Elkana Jacob, downplayed talk that lifting of the ban followed intervention from the President. "The claims are not true. It is the county which initiated the suspension. The governor was the first person to announce the lifting of the ban after talking to the operators," he stated. The county boss had been adamant on Monday that the ban would not be lifted, suggesting that he had President Kenyatta's blessings on the matter. While appearing before the Senate's County Public Accounts and Investments Committee, Mr Sonko said that he had talked with the President on the availability of the buses from the National Youth Service (NYS) to transport the physically challenged and the elderly from their stages to the CBD. He attributed his change of mind to the lack of contingency measures to address the resultant crisis as a result of the ban. The governor also said he had taken the decision to allow for further consultations with all affected parties in order to find a lasting solution to the problem of vehicular congestion. "I have noted with deep concern the plight of Nairobi residents as a result of the ban, and hereby announce that the full implementation of this directive has been suspended with immediate effect. During the coming days, I will continue to hold discussions with affected parties to find a way forward," he said. The county boss spoke after holding a meeting with a section of PSV operators under the Association of Matatu Operators (AMO). Mr Sonko noted that the ban had resulted in chocking traffic gridlocks that had hurt businesses in the county and advised residents to consider carpooling to end traffic jams. "Let us all be proactive to resolve these endemic traffic gridlocks that threaten our existence and growth as a proud, emerging city. Let us all be the solution. Both at a personal and corporate level. Not just the PSVs," he said. 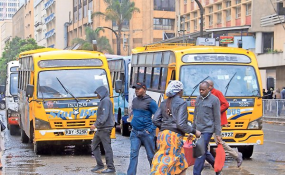 Going forward, Mr Sonko gave matatu operators in the city three months to shape up, adding that in the meantime, only three vehicles per sacco will be allowed into city centre stages. In the meantime, the High Court also temporarily suspended implementation of the ban pending the hearing and determination of a case filed by businessman and Jubilee politician Paul Kobia. Justice Wilfrida Okwany ruled that Mr Kobia had established that the ban had adversely affected the country's economy and subjected city residents and guests travelling into the city to untold agony. "Nobody knows how long the reprieve pronounced by Mr Sonko will last," Justice Okwany said, adding; "It may be revoked any time." She said Mr Sonko and those concerned did not put in place measures to mitigate the suffering of special-needs people such as the disabled, pregnant mothers, the elderly, children, and the sick, among others. Justice Okwany certified the case filed by Mr Kobia as urgent and set the hearing for December 11. Mr Mike Sonko said he changed his mind due to lack of contingency measures to address the resultant crisis as a result of the ban. He had taken the decision to allow for further consultation with all affected parties, in order to find a lasting solution to the problem of vehicular congestion.